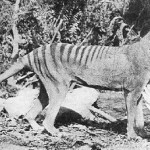 The movie imagines the elusive animal really does survive, only a big drug company wants to kill it off for a magic potion it secretes.This is by no means the movie wildlife watchers would make about the fantastic hope that a living thylacine represents. 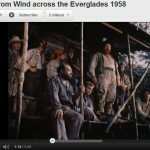 A 1958 schlocky movie had the star power to ignite the environmental movement–if it hadn’t gone so horribly wrong. Birders are overly eager for their starring role in The Big Year, the first big budget movie on bird watching. Even with Steve Martin, competitive birding can’t be cool. Getting ready for a trip to South Africa to see wildlife, I subjected my husband to yet another travel video I found on Netflix called Destination Africa, which purports to be from 2005. What I got was easily the most awful and awkward travel documentary ever made on Africa. The wolves at Longleat Safari Park in England were impressed with the realism of Twilight: New Moon. At a special showing in the their park west of London, they paid attention to the wolf scenes and howled back, the Telegraph reports. They’re just the latest tie-in wolf parks are making with the vampire movie. Sure, the whole “World Wolf Premiere” thing is a ploy for the DVD release. “Whilst we’re used to deafening screams for Robert Pattinson, it’s a nice change to hear howls of approval for the rest of the cast, including the screen wolves themselves,” one movie promoter said. But at least the wolves were entertained. Or enriched, as animal care people say. They circled the giant screen pulled by a semi, making sure it wasn’t a predator about to attack. Then they started watching and sometimes howling. “They seem to be really keen on the wolf bits,” Ian Turner, the park’s deputy head warden said. The folks at Indiana’s Wolf Park were way ahead of the Brits. In January they hosted a special night for Twilight fans, who learned the differences between real wolves and those hunks in the film. We’ve seen the battle between whalers and whale-watchers turned into a reality TV hit in Whale Wars; now it’s moving to the horror film genre. Iceland’s Harpoon: The Reykjavik Whale Watching Massacre features whale watchers cast adrift at sea who are preyed upon by rogue whalers. You’d think Iceland–where whaling and defying international opinion–are considered almost a patriotic duty, would produce a film with the Sea Shepherd crew on the rampage. But this film seems to be, dare I say it, more subtle. The family of whalers has gone mad–after they aren’t allowed to hunt whales anymore. 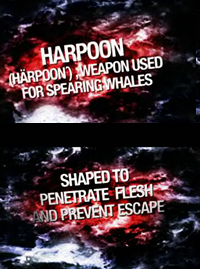 The trailer shows the whalers shooting harpoons at someone in the water. And the tourist cries out, “No! Please! I’m a friend of nature! No! Argghh!” So, the tourists pretty much had it coming. I’d want to harpoon anybody who said that. I haven’t had access to the film, which played at the Glasgow Film Festival in February and is set to be released in the UK on DVD soon. The MonstersandCritics blog horror fan pans it as “just another average horror film with various characters being pitted against a family of psychotic whale hunters.” But I’m glad to see the whale issue now playing out in pop culture. Hey, every movie can’t be The Cove. The Cove is a movie about dolphin slaughter in Japan, but the filmmakers have the sense to know that an hour of dolphins being harpooned, flailing and bleeding to death would be unwatchable. Instead they tell the fascinating, adventure story of trying to get footage of a slaughter of dolphins that Taiji, Japan tries desperately to keep secret. Spoiler alert: they get the footage. And here’s where the audience feels like they’re participating. The point of the effort is to get the word (and video) out on how horrific and unnecessary the process of killing 23,000 dolphins a year is. It’s an act of faith by the filmmakers that once the world knows this will have to stop. And just by witnessing The Cove, you fee like you’re part of their journey. They also list things you can do to help. You can write President Obama and the Japanese. You can donate. You can carefully choose your seafood–for your own health and for the fish’s sake. Here are some places you can go see dolphins in the wild instead.